Derived from his popular and acclaimed Genetics: A Conceptual Approach, Ben Pierce’s streamlined text covers basic transmission, molecular, and population genetics in just 18 chapters, helping students uncover major concepts of genetics and make connections among those concepts as a way of gaining a richer understanding of the essentials of genetics. With the new edition, Ben Pierce again focuses on the most pervasive problems for students taking genetics—understanding how genetics concepts connect to each other and developing solid problem solving skills. There is updated coverage of important research developments in genetics (CRISPR) and a new Active Learning feature, Think, Pair, Share. 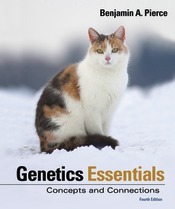 And with this edition, Genetics Essentials is available as a fully integrated text/media resource with SaplingPlus, an online solution that combines an e-book of the text, Pierce’s powerful multimedia resources, and Sapling’s robust genetics problem library.